In 3-quart saucepan, cook pasta as directed on box. Drain; rinse with cold water to cool. In small bowl mix seasoning mix from packet and Alfredo sauce. 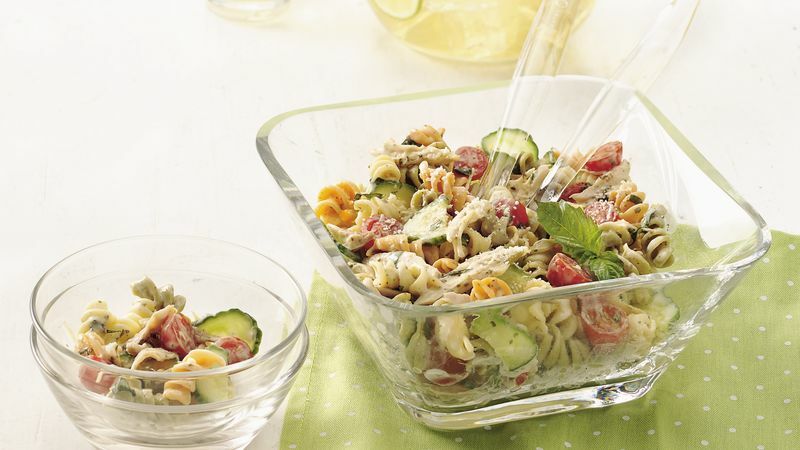 Place cooked pasta, chicken, tomatoes, cucumber and basil in serving bowl. Add Alfredo mixture; toss to evenly coat. Sprinkle with topping from packet and basil sprig, if desired. Serve immediately or refrigerate until serving time. If the Alfredo sauce and seasoning mix is too thick when combined, add 1 to 2 tablespoons of milk.